Darius Rucker’s newest album, Southern Style, follows a formulated approach in contemporary country music. The record uses slick Nashville production and songs that speak to a white middle-class audience, while romanticizing the Southern United States and the experience shared by some—certainly not all—who call it home. Where Rucker differs from other contemporary country musicians is in his focus on South Carolina as the object of his romanticism. Born in the city of Charleston, South Carolina, Rucker is well-positioned to have the state as his topical focus. However, the lyrics and iconography on Southern Style speak to a particular South Carolina experience Rucker wants to romanticize. The lyrics of “Lowcountry” praise the natural beauty of the state’s coastal area and “You Can Have Charleston” laments his separation from the city due to a romantic breakup. The album’s photos place Rucker in a rocking chair on a front porch, presumably at the beach, wearing a conspicuous belt buckle of the South Carolina state flag. The protagonists of his songs are men attracted to the innocent aspects of women, rebels without a cause or much conviction, and those attracted to the “freedom” of a rural get-away. The result of Rucker’s album is the reinforcement of a South Carolina, masculine nationalism: one whose anti-intellectualism reinforces faith, family, and the way things are. What appears to be missing from Southern Style is any critical stance on the racial and cultural politics of the region; but at second glance this is not absent from the album. Rucker’s nationalism is naturalized, just like the oak trees and sandy beaches, to form a banal nationalism, which reinforces Southern white identity and a blindness (or ignorance) to the problems faced in the state. As Rucker is African American, it begs the question: is Darius Rucker the Tim Scott of country music? To be fair, Rucker’s intent rests far away from tackling these issues. However, the romanticizing of the South always comes at a cost—one that contemporary country music repeatedly overlooks in favor of commercial success. Musically, the performances on Southern Style are impressive. Rucker has hired some of the top Nashville session “cats”—such as Brent Mason, Michael Rhodes, and Shannon Forrest—for this recording. These musicians sound if as they have played together for years—and perhaps they have: their arrangements are confident and tasteful, creating a sound comfortable in honky-tonk, indie, and rock, while never losing its familiarity as country music. Rucker’s voice remains strong, yet unvaried, with this accompaniment behind him. The melodies on Southern Style are catchy and it is notable that Rucker is listed as a songwriter on each of the albums’ thirteen songs. If you are eager for Southern stereotypes, Rucker’s album deserves a listen. If more accurate representations are your fancy, Southern Style will help you understand why race remains such a contested issue in the region: comforts, and not critical dialog, carry the day. 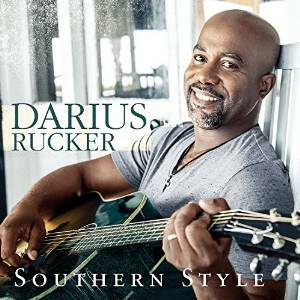 This entry was posted in Folk and Country and tagged Darius Rucker, Southern Style by aaamc. Bookmark the permalink.